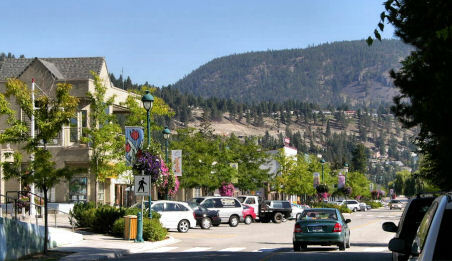 Peachland is one of the oldest communities in the Okanagan Valley. Situated on gentle hillsides overlooking the picturesque Okanagan Lake and surrounded by vineyards, orchards and miles of provincial parks, the town of Peachland offers a comfortable respite from the valley's more populated recreational areas. Its historical buildings, which include the town's first schoolhouse, built in 1898, and the Peachland Museum, (the original site of a 1910 Baptist church) provide a birds-eye-view of the area's pioneer beginnings. Accommodations ranging from motels to camping are available in and around Peachland. The town is also close to Penticton, Kelowna and the bedroom community of Westbank, which all have shopping, dining, theater and other amenities. Boating and swimming are major attractions on Okanagan Lake and Peachland's mid-point location on the region's largest lake affords some excellent opportunities for waterskiing, swimming, windsurfing, and warm weather enjoyment. The town has a public marina as well as several beaches, including one dedicated to dogs and their faithful companions. Peachland is almost surrounded by public parks and camping and hiking locations are easy to find. The Kettle Valley Railway trail, noted for its fascinating rail history is nearby, as is Hardy Falls Park with its seven footbridges and a tucked-away waterfall. Peachland's greatest fame comes from its association with the Okanagan Lake serpent, Ogopogo. "Nihaiaiitk," or lake demon, as the First Nations once called it, is said to live near Peachland in the caves of Squally Point. Ogopogo, which has reportedly been captured on film, is Okanagan Lake's greatest mystery, but is certainly not its only attraction.